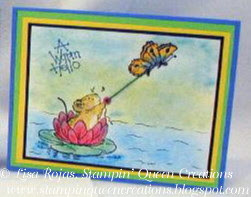 For today's Wordless Wednesday﻿ I am sharing a card I made a few years back. The card is colored with chalk pencils from Faber-Castell. My very favorite way to add color to all of my projects. If you haven't tried chalk pencils before, go out and buy a set. You will love how they blend together and you can achive a very beautiful watercolor effect if you use them with a blender pen or chalk enhancer. Designer Craft Connection- Thank you Gifts! Guest Blogger- Kristi Parker Van Doren!! !